Note, this is now updated for 2018 as we have had more information come in from the police. They are up for a great day, but if they see crazy drunkenness and misbehaviour, they will be making sure they will calm us down. Stick with your mates, find a steward if possible or flag down an officer if you find yourself in any difficulty. A Waitangi tradition is having a bit of a laugh with the police during the route of the pub crawl and this year will be no exception. 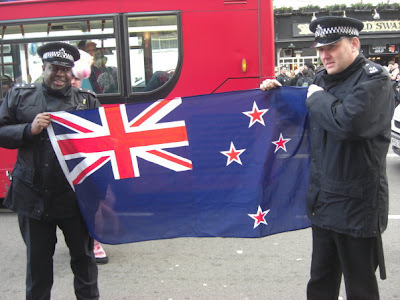 Many believe the police are quite a stern bunch but my visits and phonecalls with the police were completely the opposite as we shared Waitangi memories and jokes. They have let us know that our presence is an event the police look forward to, not just observing, but also participating in. Many police are also trying to learn the haka in time for the event! In the past we dealt with Bruce, who helped us a LOT in 2012, 13 and 14. He has been 100% supportive of the day and TV3 did a great feature of him in 2014 which you can watch here! 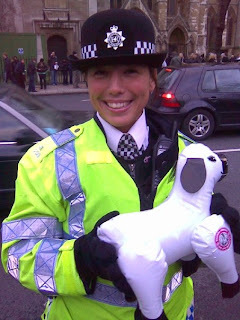 The Police just want us to be reminded about what will make the day easier for us and them. They have already done all the planning regarding blocking off the area for the haka and have police allocated (many who jumped at being involved) for the day. As many of you know, Parliament square (thanks to protesters) have made it impossible for us to have the haka in the traditional spot on Parliament Square. However, as like last year, we have been moved ever so slightly across to Old Palace Yard, and police will point us in that direction on Saturday, so that’s no problem. We’ll still have Big Ben and the Houses of Parliament as our backdrop! Look after yourselves and your mates. Try and have a decent breakfast and eat along the way. Running in front of traffic or straying too far off crossings isn’t such a great idea. Look out for your belongings and throw your trash out in bins. (Police will ask Westminster to provide more bins for the event) Please don't chuck litter/cans on the ground, be a Tidy Kiwi and hold on until you see a bin. Drinking on the street and underground will be challenged by police, please try and keep it to the pubs. Police ARE going to enforce the street drinking ban if you are caught being dumb and waving about open vessels. They WILL be handing out exclusion notices which are warnings to those who think they're above the law. If you get one of these, get out of the area or you may be fined. If the police direct you, please try and follow their directions.That’s pretty much it. 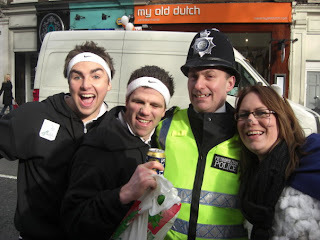 We have to admit the police were extremely enthusiastic about the event and want it to run for many many more years without any problems for us or them. It’s a sign that we have been bloody brilliant in previous years for them to still be this good natured about it considering all the trouble that the police have had in London over the last 12 months. Don’t forget while we’re out there enjoying the crawl that the police have been working extremely hard recently and we should take a moment to thank them for being legends during the riots and being hugely supportive of our annual event. We couldn’t have honestly have asked for a better bunch of officers working with us on the day, so we know it will be a wicked day out!